This lovely young woman was in the right place at the wrong time cutting her life short much too young. 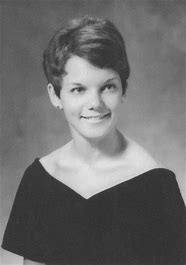 Ginny was a Miami of Ohio cheerleader and member of the Alpha Chi Omega sorority, who had many opportunities when she graduated college in 1970 but elected to join the American Red Cross to serve with the SRAO (Supplemental Recreational Activities Overseas) program -- affectionately known as Donut Dollies. “Donut Dollies” were young women with college degrees who volunteered to serve their country by going to Vietnam to operate Red Cross Recreation Centers. They helped boost morale by staging audience-participation games for U. S. troops. The military asked the Red Cross to provide this service. Volunteers like Ginny wanted to do something important, to make a difference in the world. Following Red Cross training, Ginny received orders to Vietnam, arriving on Aug. 2, 1970. She was assigned to the 25th Infantry Division's base camp at Cu Chi, 16 miles northwest of Saigon. Ginny hit the ground running, embracing the activities that she and her colleagues conducted to perk up the morale of troops at fire support bases and outposts reachable only by helicopters. She learned quickly that settling in meant adjusting to the torrid heat, malaria-carrying mosquitoes, and enemy mortars and rockets. But barely two weeks after her arrival, she was murdered in her own room. Screams from the women in the hooch brought MPs and medical personnel, who attended to Ginny until the ambulance arrived, but she was pronounced dead at the base hospital from hemorrhage secondary to stab wounds. She had not been sexually assaulted. Though there were witnesses of a man fleeing by both the women and military police and 2 possible suspects who were investigated and let go. To this day no one has been charged for her murder. The Red Cross evacuated the other Cu Chi Donut Dollies following the homicide and they did not return for two months. While Ginny's name may not be on The Wall at the Vietnam Veterans Memorial in Washington -- none of the three "Donut Dollies" who died during the war is memorialized there -- but she died in Vietnam serving the men in uniform and her country and she is memorialized by the Vietnam Women's Memorial. Ginny’s six siblings attended the dedication ceremony at the Brookfield Village Green. Karen Conklin, Executive Director of the Red Cross Lake to River Chapter had been invited to speak. Several other Red Cross representatives attended, and volunteers handed out water from a Red Cross emergency response vehicle. Ginny Kirsch’s eagerness to serve her country from her heart deserves to be honoured as a WOW Gal Angel.